Have you heard the news? Spinach is the new chocolate. It’s showing up in everything. People can’t get enough. It’s highly addicting. Spinach makes people sooooo happy. The good news is: They are eating it. ALL of it. And they aren’t complaining. Even the pickiest one. Why aren’t they complaining? 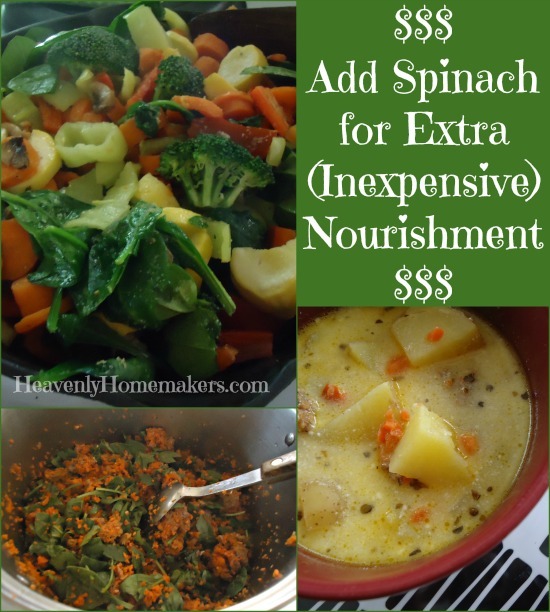 Because you can add spinach to many, many recipes and it will not change the flavor. It will only add nutrients. And…it might turn the food green, but whatever. I’m not trying to hide the spinach. I’m just trying to add goodness to our food in every way possible. Spinach has 19 amazing nutrients. Nineteen!!!! Vitamin K, vitamin A, manganese, folate, magnesium, iron, copper, vitamin B2, vitamin B6, vitamin E, calcium, potassium, and vitamin C, fiber, phosphorus, vitamin B1, zinc, protein, and choline – all in a spinach leaf. Impressive. The best news of all? 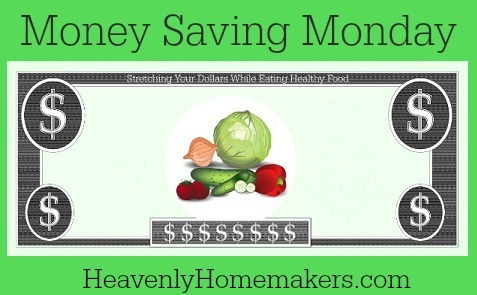 Adding spinach to your recipes is a very inexpensive way to eat healthier. I paid $6 last week for a pound of spinach. That sounds like a lot of money until you recognize that spinach is very light weight and one pound of spinach is enough to stuff my pillow. I add spinach to meal after meal after meal. Just think of it. For about 75¢ per meal, I can add 19 fantastic nutrients to my dish. I find that simply tearing up handfuls of raw spinach with my hands and throwing it into the cooking pot works great. My cousin said that she dumps a package of raw spinach into her food processor, adds just enough water to help it spin, then purees it. Then, she freezes the pureed spinach in ice cube trays, throwing a frozen spinach cube into recipes. Brilliant! If you haven’t tried adding spinach to your recipes, I highly recommend it! If you have tried it, leave a comment to share what has worked for you. Mainly smoothies. It’s green or brown but they still love it. Even better when there is cocoa powder involved. We love to add spinach to things. Well- as long as its finely chopped and my 5 year old doesn’t notice it. Of course our smoothies; But we’ve always put it in our lasagna or other casseroles, and use it in place of lettuce on sandwiches. I can’t wait to try it in some of the other menu items you listed. We also make green smoothies with it when we have it, spinach makes the nicest smoothie out of all the greens we’ve tried. I used to love to add spinach to all kinds if dishes, including our smoothies until I found out I was allergic to it! Now I use other greens like kale, turnip greens, collard & mustard greens. All still very tasty and nutritious. You always have a great sense of humor. I add it to my smoothies. I purchase a big bag and throw the entire bag directly into the freezer (as long as the spinach doesn’t need to be washed!). When I go to make a smoothie, I just grab a large handful of the frozen spinach and put it in the blender. It works great! It does make the smoothie a little greenish/brownish, but you cannot taste it. I add it to soups, pastas, meatballs, meatloaf, mashed potatoes.. almost anything (except coffee!) Thanks for the tip, Laura! I add it to spaghetti sauce…it was actually my 17 yo daughter’s idea. Ground beef, tomato sauce, spices…and spinach. Tastes about the same as regular spaghetti! You can also dehydrate spinach – just pile it up on your dehydrator trays. Once it’s dehydrated, it will last forever. You can blend it up and make spinach powder with it. 1 T. of spinach powder equals 1 c. of raw spinach!! You can add this to frosting to make it green, tortilla dough, pasta dough, or anything else really. I serve it over cheese or chicken & cheese filled enchiladas. I, too, freeze my fresh spinach in a ziplock bag, pressing out all of the air. Once it is frozen it crumbles easily. My favorite is to add it to your easy breakfast casserole along with a tablespoon of minced onions and a few dashes of paprika. All of my preschoolers eat it! Aldi had something called “Spinach Dinosaur Bites” in the clearance freezer section. My Girl is into dinosaurs right now, so I took a closer look. They are Tater Totts (in dinosaur shapes) with SPINACH! And yes, my girlie got a dinosaur tatertot spinach treat! (They are tasty)..